Online multiuser document editing is one of the popular ways to collaborate in real time. Not only all changes are instantly visible to all participants of the process, you don’t have to have pricey MS Office installed on your PC in order to work with documents online. 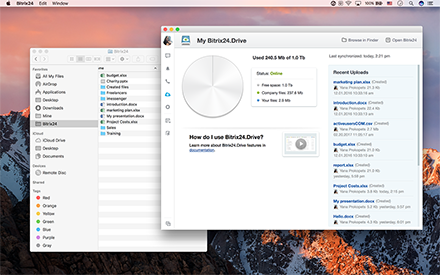 Bitrix24 lets you share files with people inside and outside your company in Dropbox-like manner, including password-protected and time-restricted file sharing. 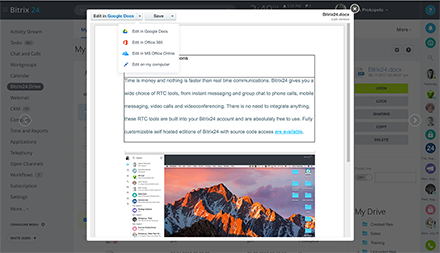 Bitrix24.Drive allows managing and synchronization of workgroup and company files between the local PC and Bitrix24 cloud account, meaning as soon as you add a new file or edit an existing one, it becomes available both in cloud and on PC of every group member who has Bitrix24.Drive enabled and is authorized to access the document. iOS and Android mobile devices are supported as well. Getting documents approved or revised or rejected is part of most collaboration routines. 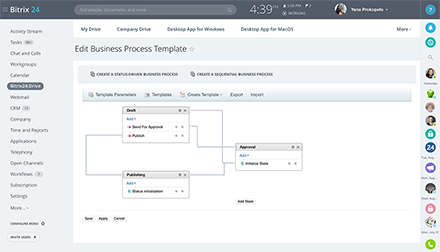 Bitrix24 allows creating custom document approval workflows including but not limited to simple approval, majority vote, expert opinion, two or multi stage approval, mandatory reading and mandatory mutual approval. Free document collaboration is available in Bitrix24 for groups of up to 12 people. The free account includes 5 GB worth of online storage.